Over 60 towns have joined the rebellion, so far. Iran is awakening. Iranians are demanding their freedom, democracy and rights. They regretted supporting a revolution that turned against them. When Iranians protested, mostly in Tehran, for the best half of 2009, they were angry about the rigged presidential election in which Mahmoud Ahmadinejad defeated his “reformist” rival Mehdi Karroubi. The “Green Revolution,” was about the government —not the regime change. It was led by an elite, educated and well-to-do metropolitans supporting to the reformist movement. Recent protests are different in many ways. It started in Mashhad, a conservatively religious city, and the birthplace of Supreme Leader Ayatollah Ali Khamenei, where some 160,000 angry investors lost their life savings in a fraud residential project. Banks owned by the Revolutionary Guards suddenly closed down wiping out all deposits. And many companies haven’t paid salaries for up to a year! For a couple of years, after the burning of the Saudi Embassy, Shiite tourists from wealthy Gulf region ceased to come and hundreds of business closed down. Poor, unemployed and hungry people went out to call for a new revolution. They were calling Khamenei a dictator who lives in luxury while his people suffer, wishing him and President Hassan Rouhani death, as both of the are two sides of the same coin. The city is governed by two of Khamenei top allies, Ayatollah Ahmad Alamolhoda and Ayatollah Ebrahim Raisi. The latter had participated and lost in the last presidential elections as representative of the supreme leader’s camp and the hardline movement. Other cities followed. Isfahan, the third largest city in Iran, after Tehran and Mashhad joined the ranks. Teachers and retirees came out demanding their salaries and money lost in the failing banks and projects. The city is also a religious and conservative town. Its support of the Khomeini revolution in the late seventies was a decisive factor in its victory. Tens of thousands of their sons were killed in the Iran-Iraq war. One protester has lost four sons in Iraq, and a fifth in Syria. Instead of rewarding him, they took away his pension, he complains. Now, he cannot support what is left of his family. He is not alone, according to official statistics, 20 percent of the population is below poverty line and 40 percent of them need food aid, that is 60 percent of the 80 million Iranians. Twenty millions live in shantytowns. Not to mention an inflation rate exceeding 20 percent, and a currency rapidly losing value. The result is a hike in rates of crime, drug addiction and prostitution. These slogans summarize the sentiments of the Iranian people about their regime’s foreign policies and their devastating repercussions on development, economy and society. While austerity measures worsened an already tough life, the Syrian regime received $20 billion to kill its own people, and Hizbollah gets $1,200 billion a year to do the regime’s dirty business. Not to mention other costly expenses to support militias in Iraq, Yemen and Bahrain. As a protester put it, “We give an Afghan, Pakistani or Arab terrorist up to $1500 a month, with accommodation, food and transportation, while I live in a shack, and my hard-earned income of $250 is delayed or stolen. Few former Iranian leaders sided with their people. Former President Mahmoud Ahmadinejad has just revealed the existence of 63 bank accounts for the head of the judiciary Ayatollah Sadeq Larijani and the corruption of his brother Ali Larijani, the Parliament Speaker. Others exposed the extent of criminality that reached the highest offices. Top bosses in ministries, banks, charities and religious institutions were found guilty of embezzlement, fraud, sexual harassment and child abuse. Worse, the leadership, including the Supreme Leader, has protected and defended the guilty and tried to hid their crimes. If the large, industrial and commercial metropolitans groan, imagine the suffering in the remote and marginalized areas. The racist and sectarian regime has always ignored the mostly Sunni Kurdish, Baluchi, Kurdish, Azeri, Turkmen and Afghan communities. Shiite Arabs fared no better. Over 60 towns have joined the rebellion, so far. Iran is awakening. Iranians are demanding their freedom, democracy and rights. They regretted supporting a revolution that turned against them. The world is watching, as it did in the spring of 2008. This time around it should interfere if the regime terrorizes its own people. Since they pretend to be a democracy, they should be held to its standards. This article was first published in the Saudi Gazette on January 2, 2018. Dr. Khaled M. Batarfi is a Saudi journalist and writer based in Jeddah. Back in those pre-9/11 days when I identified as a liberal, the one thing I was sure drew all my then cohort together was opposition to fascism, whether secular or religious. Boy, was I wrong and never was that more clear than in 2009 when the Green Movement demonstrators were marching through the streets of Tehran and other Iranian cities, demanding freedom from the mullahs. The whole world was watching, as we used to say in the sixties, only their cause was purer than ours was then. The horrifying theocrats who ran the “Islamic Republic” regularly raped women in prison before they killed them, hanged homosexuals in the streets and tortured just about everyone else who didn’t comply with the edicts of their Islamofascist regime. I can’t think of a moment I was more disgusted by the acts (inaction actually) of an American president. What did he stand for? What did we stand for? Well, who knows? What we do know is he wanted to deal with Iran his way — whether to get the glory for himself or for other even less attractive reasons we will never know. He was secretly communicating with Ahmadinejad and Khamenei even before he took office, hinting at accommodation. 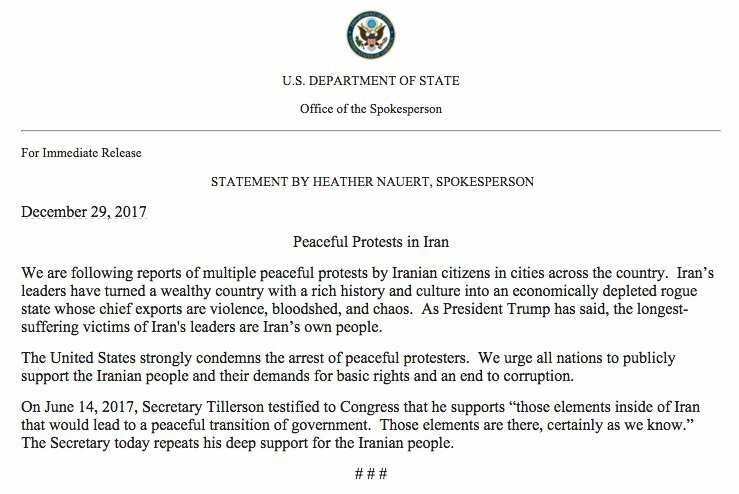 Obama was silent for those students and millions of other decent Iranians. He wanted his deal so much that, as we know, he sent still more millions to the mullahs in cash, so they could use those dollars in any untraceable manner they wished — such as funding Hezbollah and the Houthis. And speaking of Hezbollah, we all know now, due to reporting about Project Cassandra by Josh Meyer at Politico, that Obama was so determined to make his creepy deal that he acceded to the mullahs’ demand to pull the FBI off a detailed investigation of the Hezbollah thugs’ extensive involvement in the U.S. drug trade. Are we sick yet? What we also know is that the Donald J. Trump administration has taken the exact opposite approach from the Obama administration to events in Iran. They are unqualifiedly — and immediately — supporting the demonstrators and democracy. Bravo! When somebody asks me — as they have on occasion — why I am not a liberal anymore, I now have a simple answer: what’s that? UPDATE: Other places to follow the unfolding events are the Twitter feed of the extraordinary Omri Ceren and forthcoming posts — we know they’re coming — from PJM’s Michael Ledeen. Fingers crossed this time. The opinions below are those of the author and do not necessarily reflect those of Clarion Project. In contrast to other countries that lack a opposition that can be trusted, Iran enjoys an internationally-recognized alternative based on democratic values acknowledged across the globe. The National Council of Resistance of Iran (NCRI) and its pivotal member, the People’s Mojahedin Organization of Iran (PMOI/MEK), is the largest and most organized opposition in the face of the Iranian regime. The NCRI enjoys widespread support inside Iran and throughout the world, with the ability to organize an uprising against the regime in Tehran. Senior Iranian regime officials have acknowledged the time and again that the main threat compromising Iran’s entire regime apparatus is none other than the PMOI/MEK. To this end, they have focused their entire efforts on physically obliterating this Iranian opposition group. In 2009, when the Iranian people took to the streets and demanded fundamental change, their efforts went unsupported due to Obama’s appeasement policy that sought to sign the nuclear deal with Tehran at all costs. This was an opportunity that enjoyed the potential of significantly decreasing existing Middle East crises. Today, the regime in Tehran is facing crises far more dangerous than 2009. The correct Iran policy is supporting regime change by the Iranian people and their organized and legitimate resistance. By adopting such a stance, the international community can begin to confront Iran’s notorious influence in the region and its nuclear ambitions in order to spread security in a non-nuclear Middle East free of terrorism. U.S. Secretary of State Rex Tillerson announced at a press conference on April 19 that the White House is evaluating its policy on Iran. This policy overview will not merely cover the Iran nuclear deal, but will be a comprehensive look at all Iran-related issues. At a press conference, Tillerson formalized Iran’s provocative and destructive measures in different fields. “Iran is the world’s leading state sponsor of terrorism and is responsible for intensifying multiple conflicts and undermining U.S. interests in countries such as Syria, Yemen, Iraq, and Lebanon, and continuing to support attacks against Israel … An unchecked Iran has the potential to travel the same path as North Korea, and take the world along with it … Iran’s provocative actions threaten the United States, the region, and the world …” he said. “Iran continues to have one of the world’s worst human rights records,” Tillerson added. Iran’s meddling has neutralized all efforts to resolve the region’s crises, said Bahrain Interior Minister Rashed bin Abdullah at a Gulf Cooperation Council (GCC) session, adding the region faces threats that demand cooperation to confront. He emphasized the need for unity in Gulf positions regarding strategic matters. What is the right Iran policy? Supporters of the Iran appeasement approach believe the correct policy is to engage the mullahs’ regime and continue dialogue. They justify this approach for two reasons: first, to contain Iran’s nuclear ambitions and second, to attempt to establish change from within by supporting so-called “moderates” inside the regime apparatus. This is the policy pursued during the Obama years without any political or strategic reservation, and also that of previous administrations throughout the past few decades. However, rapprochement with Tehran not only failed to contain the mullahs’ ambitions and terrorism; in fact, it further encouraged the regime and plunged the entire Middle East into insecurity and instability. Yet, the solution placed forward by Obama and the State Department’s experienced diplomats resulted in Iran escalating its flagrant human rights violations and expanding its devious influence throughout the Middle East. Others believe the right Iran policy is a military solution and the U.S. must launch airstrikes targeting Iran’s nuclear sites. Although this can deliver significant blows to Iran’s ambitions and disrupt the mullahs’ efforts to obtain nuclear weapons, the consequences on regional security and stability are controversial, placing the U.S. and its allies in yet another Middle East war. What is the durable solution? Can we avoid war while bringing an end to the spread of extremism and terrorism across the globe? Iran is the leading state sponsor of terrorism in today’s world. Since the appeasement policy adopted by previous U.S. administrations has been fruitless in containing Iran and actually led to the current dangerous circumstances, the only viable long-term solution is to adopt a firm policy that hinges on regime change. Following a visit paid by Senator John McCain to Albania and his meeting with Iranian opposition leader Maryam Rajavi, an analysis posted on April 27 in Iran Dideban, a state-sponsored outlet, made vivid the regime’s concern that the Revolutionary Guards (IRGC) failed to quell and destroy the PMOI/MEK. Whatever the case, it’s “heavy water” under the bridge at this point, but should alert us even more to the absolute necessity of revealing everything known about the also Obama-instigated Iran Deal, all its myriad hidden codicils and clauses that remain mysterious to the citizens of this country in whose name they were allegedly signed. That agreement too could be the product of useful idiocy, a sucker punch from the mullahs. The devil, in this case, is very much in the details, few of which we know, except that the Iranians refused to give a baseline development level for their nuclear weapons program in this first place. In a sense, that made everything else moot. Nevertheless, Iran has been the beneficiary of this deal to the tune of billions of dollars, some evidently in cash, much of which has been and is being spent in Syria, if not directly on chemical weapons, on a war that no less than the former chief rabbi of Israel, himself a Holocaust survivor, has called another Holocaust. Iran is also using the money to finance Hezbollah in that war, simultaneously arming those terrorist thugs with tons of modern weapons, including long range missiles, even while the mullahs use Hezbollah’s guerrillas as cannon fodder to spare Iran’s own quasi-terrorist Revolutionary Guard. The Islamic Republic’s obvious goal is to control both Syria and Iraq by proxies. A victorious Assad would be Iran’s boy as much as Russia’s, possibly more. The Trump administration should expose this deal in its entirety to public view now. If that means Iran pulls out of the agreement — as they have warned — so be it. The transparency is worth whatever minimal insurance against a nuclear-armed Iran might be inherent in these evanescent documents. After seeing just how much insurance against chemical weapons was inherent in Obama’s deal with Putin over the crossing of our then-president’s “red line,” one could be skeptical that there is any at all. Indeed, what little we know of the Iran Deal leads one to believe that it would be simple for the mullahs to be as busy as ever on their nuclear program. That they are allied with North Korea makes this all the more likely. Further to be investigated is Obama’s peculiar desire to make a deal with these same mullahs from the very beginning of his administration or even before. Indeed, Obama representatives have been accused of meeting with both Hamas and Iran during his first presidential campaign. These meetings are better documented than Trump’s supposed collusion with Putin, which seems so unlikely now. Obama and Kerry then welcomed the election of Hassan Rouhani, whom their cheering section in the willfully ignorant mainstream media ludicrously called a “moderate” when he was, if anything, worse than Ahmadinejad and has since been responsible for many more murders of political prisoners than his predecessor. They made their deal with Rouhani, who is obviously now cooperating in the maintenance of peace…. Well, not exactly. What’s behind all this? As I said at the outset, this is disturbing — liberalism and progressivism turned upside down, at least according to their own self-described principles. Everything is situational. That Democrats like Schumer and Pelosi were so positive about Trump’s actions in Syria is a sure sign that not so deep down they were more than a little uncomfortable when Obama did nothing after a similar gassing. Like a lot of people I would imagine, they had to bury their feelings and opinions in the name of party loyalty, what the French called mauvaise foi. They should have felt the same way yet more intensely after Obama’s execrable non-reaction to the Green Revolution. Maybe they did, but we’ll never know until someone leaks it out in a memoir. We didn’t need to send in the Marines. All Obama would have had to have done was to say a few words of encouragement echoed by the international community and the revolution might have happened. It was close enough. Thank God there’s a new sheriff in town. Maybe there will be some hope for the citizens of Iran, eventually, some support for regime change after eight years of kowtowing to the mullahs. But for now lets at least clear up the terms of the mysterious deal, its provenance and its usefulness, if any. No time like the present. U.S. President Richard Nixon went to China. President Barack Obama will not be going to Iran. Nixon’s 1972 visit to the people’s republic included meetings with both Chairman Mao Zedong, the communist revolutionary leader, and Premier Zhou Enlai, the pragmatic head of the government. Detente and normalization of relations followed. By stark contrast, Ayatollah Ali Khamenei, the Islamic republic’s revolutionary supreme leader, and Hassan Rouhani, the pragmatic president of the theocratic regime, will not deign even to share a bottle of pomegranate juice with Obama, president of “satanic” America, their avowed enemy. Obama appears unperturbed, confident that detente and normalization of relations — not to mention a more stable Middle East — lie at the end of the road he began to pave with his 2015 Joint Comprehensive Plan of Action, a nuclear deal that garnered neither Congress’ endorsement nor the public’s approval. The fraught controversy over how we got to this point and where we’re heading is the subject of a new book: “The Iran Wars: Spy Games, Bank Battles, and the Secret Deals that Reshaped the Middle East,” by Jay Solomon, chief foreign affairs correspondent for The Wall Street Journal. Eventually, Dubowitz, working with Senator Kirk’s then deputy chief of staff Richard Goldberg, came up with a “financial bomb”: a Belgium-based financial firm called SWIFT “which hosts the international computer network that facilitates virtually every banking transaction in the world through an extensive messaging and financial tracking system.” The Obama administration opposed expelling Iran from SWIFT but “Congress once again overrode the White House’s concerns and unanimously passed” legislation in 2012 that “de-SWIFTed” Tehran. By 2013, such measures, “were crippling Iran’s economy.” Had the pressure been intensified — or even just maintained — who knows what concessions Iran’s rulers might have made to avoid economic crisis and collapse? But Obama eased up on Iran in exchange for an interim agreement. After that, few if any Iranian concessions were forthcoming. Khamenei insisted that his red lines be observed while those laid down by Obama were transgressed — one after another. “I have no doubt we avoided a war,” Kerry told the author in an interview early this year. He could be right. Alternatively, what he sees as avoidance could turn out to be only postponement. Based on faith rather than evidence, Kerry and Obama believe that the Islamic republic will moderate; that it will give up its ambition of establishing a vast new Islamic empire; that it will no longer dream of bringing “death” to America, Israel, Saudi Arabia and other “infidel” nations; that it will not evolve into a more formidable and lethal adversary. “Obama has wagered that Khamenei and his revolutionary allies won’t outlast the terms of the nuclear agreement,” Solomon concludes. “If they do, the United States risks unleashing an even larger nuclear cascade on the Middle East.” Yes, that’s the wager. Seems like a long shot to me.